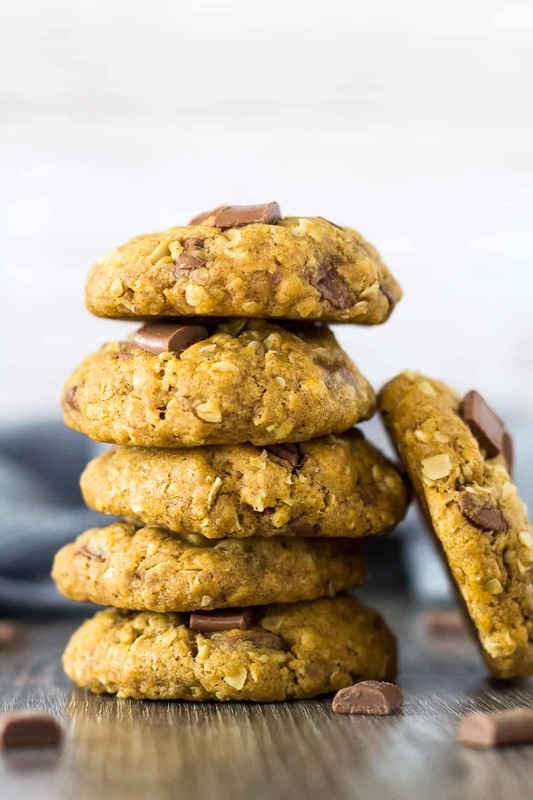 I hope you’ve been enjoying my Chocolate Chip Pumpkin Cookies, because today I bring you a new and, dare I say, improved pumpkin cookie recipe. 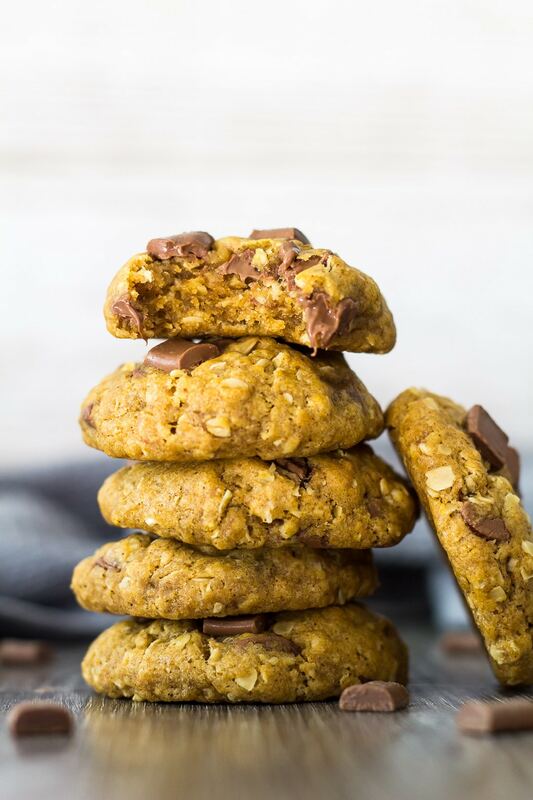 These pumpkin cookies are thick and chewy, loaded with warm, autumn spices, and stuffed full of oats and chocolate chips. 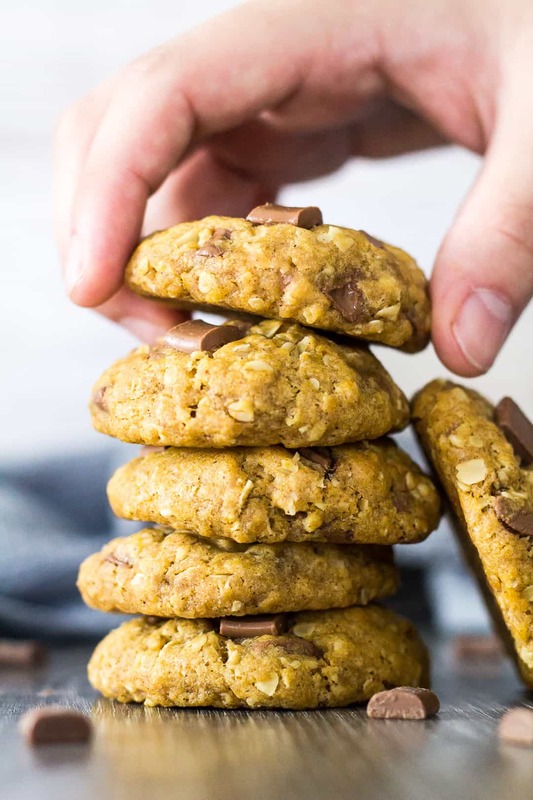 The oats in this recipe makes for extra chewy cookies! Whisk together the flour, oats, baking soda, cornflour, salt, and spices. Set aside. Whisk together the butter and sugars until combined. Add the pumpkin and vanilla, and mix until combined. Add the dry ingredients, and mix until just combined, then fold in the chocolate chips. Roll the dough into 1.5oz balls, and place onto a baking tray lined with parchment paper or a silicone mat. Press extra chocolate chips on top, if desired. Bake for 10 – 12 minutes. Allow the cookies to cool on the baking tray for 10 minutes before transferring them to a wire rack to cool completely. How long will these cookies last? These cookies will stay fresh kept in an airtight container at room temperature for up to 1 week. Can I freeze these pumpkin cookies? These cookies freeze well for up to 3 months. TIP: If you prefer freshly baked cookies, cookie dough balls can be kept in the fridge for up to 5 days, or frozen for up to 3 months! Bake straight from frozen. Whisk together the butter and sugars until combined. Add the pumpkin and vanilla, and mix until combined. Add the dry ingredients, and mix until just combined. Fold in the chocolate chips. Roll the dough into 1.5oz balls. Place on the prepared baking tray, and press the extra chocolate chips on top. Bake for 10 - 12 minutes. Do not over-bake. Allow to cool on the baking tray for 10 minutes before transferring them to a wire rack to cool completely. Pumpkin and chocolate are such a great combination! 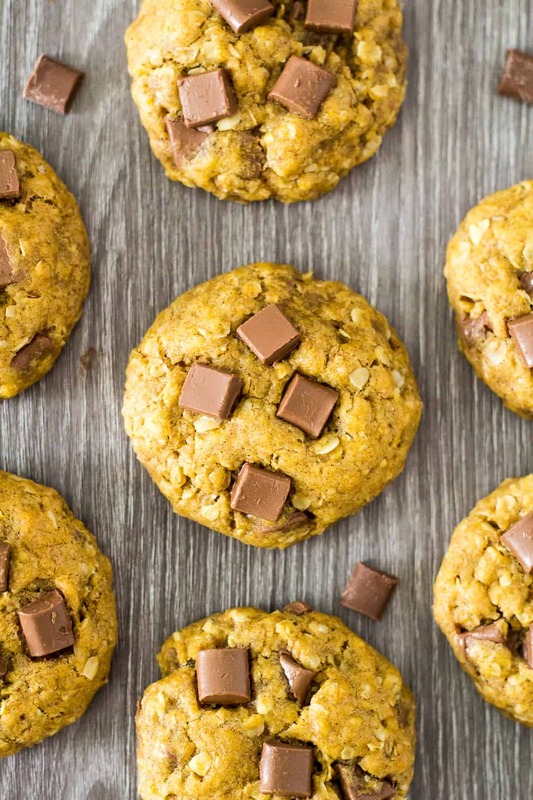 These are perfect for fall baking. Oh yes! 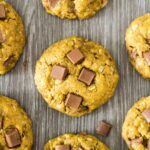 These cookies are packed with all my favorite ingredients!